This is the medium load series that provides more force and has less travel to solid than the green Danly springs. The color code is blue and there are 113 standard sizes. There is another series of Blue Metric Danly ISO Die Springs. 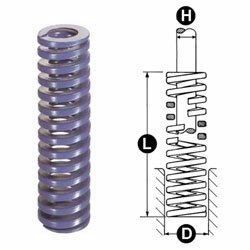 Those are the same as these inch springs with the exception that the springs' dimensions and loads shown in the catalog are converted to metric units.